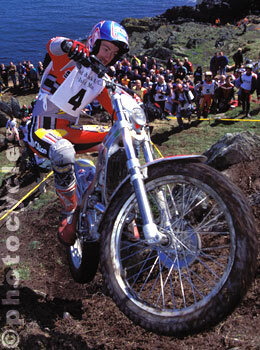 The Island can once again boast a full World Championship Trials round for 2002. 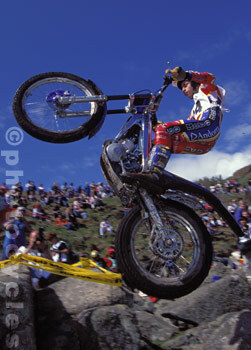 This is a sample of the spectacular action that took place from the 1999 event. 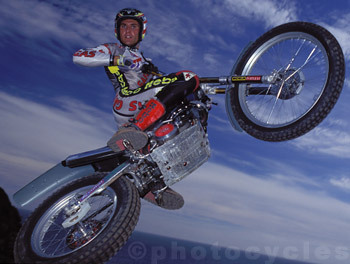 Comments: None other than Jordi Tarres 7 times World Champion, pictured in his last major trial before retiring from competitive riding. 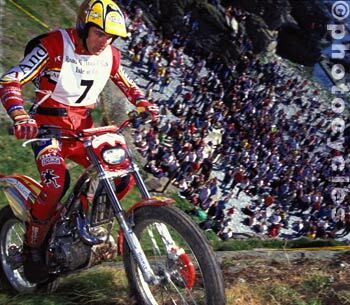 Comments: Doug Lampkin 10 times World Champion. The steepness of this slope is near 45 degrees! Comments: Doug Lampkin rides up a waterfall. Comments: The front wheel almost touches the camera, but a good lens man always gets the shot. Comments: This was a posed shot for a magazine. Paul, an ex moto cross Island champion, switched to Road Racing in 1996 culminating in a rostrum place for third in the 1998 Junior TT. Comments: Local hero Steve Colley willed on by hundreds of spectators from the beach far below. Compare this to the other shot of Steve taken at the same location. Comments: Japanese rider Fujinami, attacks what can only be described as a small cliff. 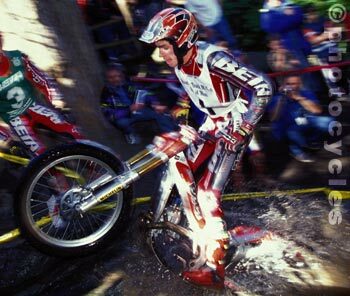 The approach to this obstacle required the bike to be held at full throttle, drop the clutch and literally ride into the base at about 20mph while lifting the front wheel ninety degrees. 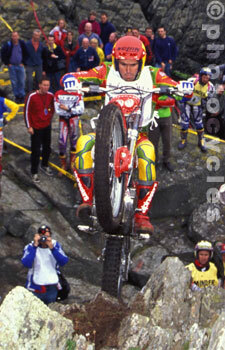 The back tyre then griped pogo-ing the machine ( and rider ) up the face. Comments: They call him the showman, and its easy to see just why Steve is so enormously popular. 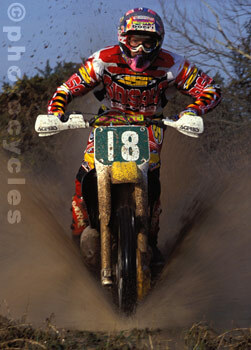 I wanted an unusual shot of Steve, something that you wouldn't normally get during an actual trial. 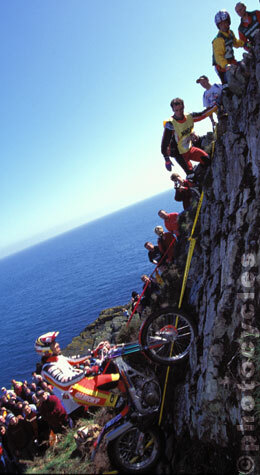 This was his own suggestion, running up from the beach 30 foot below and launching the bike high above the camera. It looked so spectacular that I asked him to do it several more times, which was no problem - until the rear suspension linkage broke. 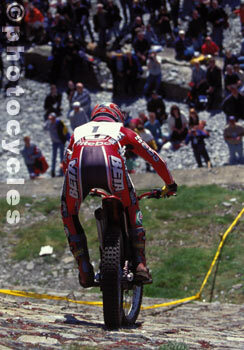 Then he casually mentioned that this was his no1 bike due to be used for the following days Manx Two Day Trial! No problem! - brought out the spare and rode to win the event for a record fourth time in a row. Comments: The abuse these bikes can withstand is hard to believe, the sump guard taking the full impact on this jump over a rock gully.